Allergic reaction – This is an immune response to something non-infectious, e.g. pollen or pet dander. Allergic rhinitis – Nasal inflammation/blockage caused by an allergic reaction. Antihistamine – A type of medication used to block the action of histamine, a prominent chemical released during allergic reactions. Antihistamines usually come in nasal spray or pill form. Apnea – Literally translates to “no breathing”. Arousal – Waking up. Frequent arousals are indicative of sleep apnea. BMI – Stands for “Body Mass Index” and is a measure of healthy body size based on the relationship between your height and weight. It is calculated by dividing your weight in kilograms by your height in metres squared. BPA-free – Refers to plastics that do not contain the industrial chemical bisphenol A. Whilst not explicitly harmful, it has been shown to bind to certain hormone receptors in the body. Buccinator – One of the largest muscles in the cheek. Exercising these muscles can help to reduce snoring. Central sleep apnea – A condition where breathing periodically stops during sleep due to the brain’s faulty regulation of breathing muscles. CPAP – Stands for “Continuous Positive Airway Pressure” and is the most favoured treatment for moderate to severe sleep apnea. CPAP machines consist of a generator, a hose and a mask which introduces a continuous flow of air into the airways to prevent them from collapsing. ECG – Stands for “electrocardiogram” and is a way of measuring the activity of the heart. These measurements are usually taken during a sleep study. EEG – Stands for “electroencephalogram” and is a way of measuring the electrical activity of the brain. These measurements are usually taken during a sleep study. ENT – Stands for “ear, nose and throat” and usually refers to a medical specialism/professional. Epiglottis – literally translating to “near the tongue”, this is a moveable piece of cartilage in the throat which separates the windpipe from the oesophagus. It marks the lower boundary of the oropharynx, the area of concern when it comes to snoring. FDA approved – This refers to a medical product that has passed safety/efficacy criteria set by the US Food and Drug Association. Hard palate – The roof of your mouth. Histamine – A chemical released by immune cells in the blood in response to allergens. It causes inflammation at the site of its release. Hyperpnea – The process of increasing the rate of breathing. This is usually a normal physiological process in response to increased oxygen demand as in exercise. Hypopnea – Literally means “low breathing”. This is a feature of obstructive sleep apnea where breathing is partially blocked. Inflammation – The body’s response to injury or infection. It consists of the flooding of immune cells and inflammatory chemicals to an area to heal it and produces swelling, redness and itching. MAD – Stands for “Mandibular Advancement Device” and refers to a mouthpiece designed to advance your lower jaw (mandible) forward to tighten airway tissue and prevent your tongue blocking your airway. Nasal irrigation – The process of flushing your nasal passages with salt water to break down excess mucus and soothe inflamed tissue. Nasal polyps – Benign growths of excess tissue in the nasal cavities as a result of chronic nasal inflammation. This can inhibit nasal breathing and cause snoring as a result. Nasal valve – The narrowest part of the nasal cavity. This can easily become blocked and lead to snoring. Non-allergic rhinitis – Nasal inflammation caused by non-allergic factors. This can be due to a number of causes. Oxygen saturation – A measurement of the proportion of haemoglobin in red blood cells that has oxygen attached compared to total haemoglobin. A normal range is from 94-99%. Positional therapy – Methods used to change people’s sleeping position with a view to reducing their snoring or sleep apnea. Post nasal drip – Mucus dripping from the nasal cavities down the back of the throat. Pulse oximetry – The process of measuring blood oxygen saturation. This is usually done by shining infrared light through the fingernail via a specialised finger clamp. Rebound congestion – The congestion side effect experienced with overuse of nasal decongestants. Reflux – Literally meaning “backflow” this describes the movement of stomach acid back up the oesophagus. This can sometimes manifest as “airway reflux” which can inflame the airway and worsen snoring. Rhinitis – Nasal inflammation; includes swelling, sneezing and excess mucus. Rhinorrhea – A runny nose. Saline – A mixture of salt and water. This is often used for nasal irrigation in a spray or a neti pot. Screening test – Questionnaires used to assess your risk of a condition, in this case, obstructive sleep apnea. Sleep apnea – A condition where you repeatedly stop breathing in your sleep (see Obstructive Sleep Apnea and Central Sleep Apnea). Sleep hygiene – The practise of good sleeping habits to give you as restful sleep as possible. This includes things like keeping your room dark and at a certain temperature, showering before bed and not eating too much before sleeping. 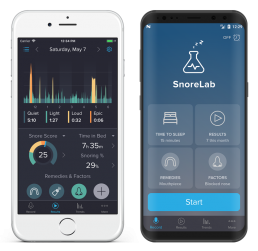 Sleep study – A test done in a specialist clinic or at home to help diagnose potential sleep disorders such as sleep apnea (see PSG). Soft palate – The soft tissue behind and below the roof of your mouth, but above the uvula. Stertor – A respiratory sound, a snore. TMD/TMJ – Stands of “temporomandibular joint disorder”, the jaw pain sometimes experienced with anti-snoring mouthpieces if not fitted correctly. Topical – Refers to a medication applied directly to the site where its effects are desired, e.g. a topical nasal spray. Uvula – The dangling tissue at the back of the throat. Oropharyngeal Exercises for Snoring – What’s the Evidence? Is Your Snoring Caused by a Dust Allergy?